Happy Halloween everyone!! Where did October go?! Well, regardless, we are excited for today. 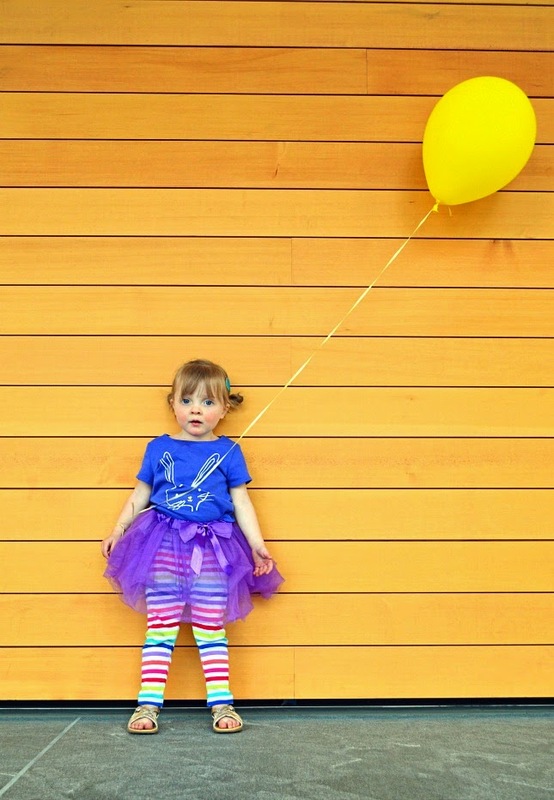 For us, our day will most likely be spent chasing candy-driven children and making memories. Funny how those two go hand-in-hand. We wish you all the happiest and safest Halloween day. 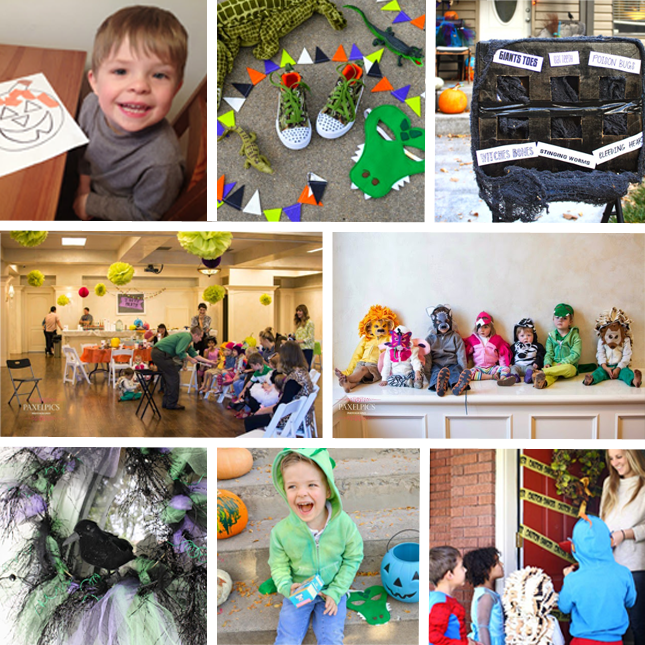 And if you are looking for some last minute ideas, here's a recap of our recent Halloween posts as well as a couple from last year too. See! Some pretty awesome ideas, eh? Happy Halloween everyone!!! 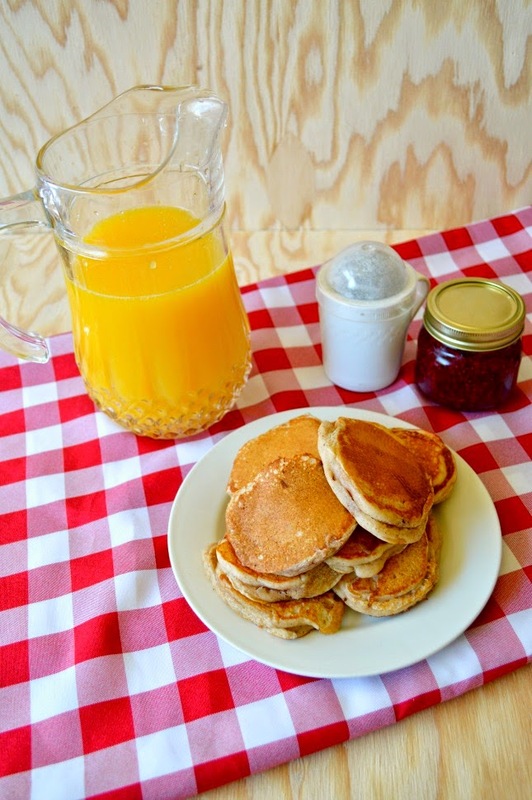 Saying, my kids and I LOVE breakfast foods would be a HUGE understatement. We could eat the foods served during this particular meal time every flippin' day. And when it comes to apples, we devour those things like pot heads do their "special brownies". So, I'm constantly on the lookout for fun and new recipes that combine these two obsessions of ours; and this time I have an awesome one! I know, I couldn't believe it myself! But dang, these were G O O D! 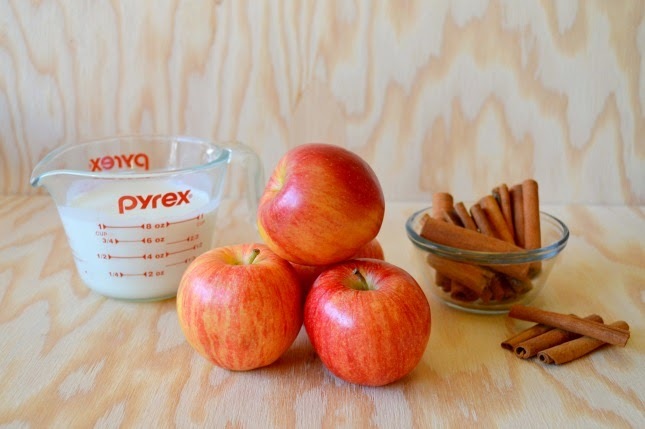 The perfect combination of pancake batter and apples, this is a fabulous recipe to whip up on the cold Autumn mornings many of us are now experiencing. Plus, the main focal point of this recipe is a friggin fruit; making it very easy for you to sneak a little extra healthiness into your meal if your kiddos are little on the picky side! Sneaky, I know. But what they don't know wont hurt them, right?! Or am I the only one with that mantra here? Bonus, if you're motive isn't to be sneaky with incorporating a healthy fruit into this meal, then this recipe is a great one to the kids involved with; giving you an extra opportunity to bond with one another. Have I sold you yet? I thought so! 1. In a medium bowl, toss the apple slices and lemon juice, then sprinkle the fruit with 3 teaspoons sugar and 1/2 teaspoon cinnamon. 2. In a medium bowl, whisk together the remaining sugar and cinnamon with the baking powder, baking soda, flour, and salt. In another bowl whisk together the remaining ingredients. Add the flour mixture and whisk into a slightly lumpy batter. 3. In a large skillet over medium heat, melt 1/2 teaspoon butter. Spoon batter over and apple slice, letting the excess fall back into the bowl (this coating method will keep the slices from breaking). Place the pancake int he pan, then repeat with two more apple slices. 4. 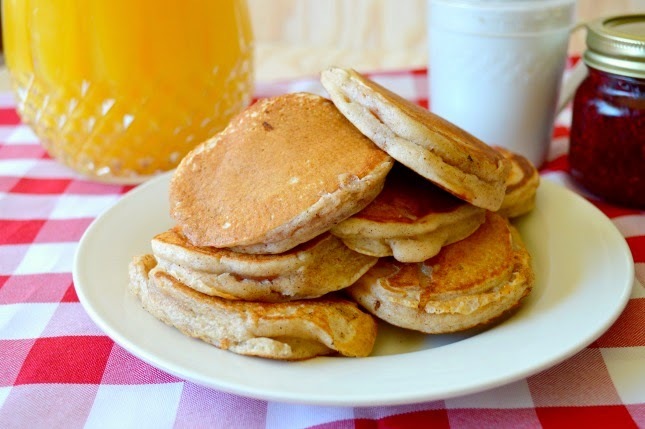 Cook the pancakes until golden brown on each side, about 5 minutes per side. Cook the remaining apple slices, adding butter to the pan as needed. Serve immediately. My living room as of two pm yesterday. No filter. I'm going to get real with you guys. I see pictures, countless pictures, of homes and lives perfect in every way. The walls of these homes are carefully chosen shades of white and gray. The furniture is made from deep rich woods or painted stark white. The occasional piece is a bright pop of color. Every accent is purposefully arranged so your eye flows across the room gazing upon the splendor without a seam. The people who live in these homes have the hair of the gods and clothes from tomorrows Gap catalog. You might know these people. You may even be one of them. On Instagram your pictures fill my explore page. And as I have entered the world of blogging and designing and this culture of internet self-promotion, I see the beauty these people are trying to portray. I have also felt the pressure to imitate them. As a blogger I have been told that pictures are 90 percent of blogging. Here at The Mumsy Blog, we have a certain standard when we choose pictures to share. We do believe that we should be honest and try to do so sincerely through our writing. But I feel like I haven't been real enough through my pictures. So today I want to share my real world. Maybe for some bloggers, that world of perfection is real. But for me, it is not. 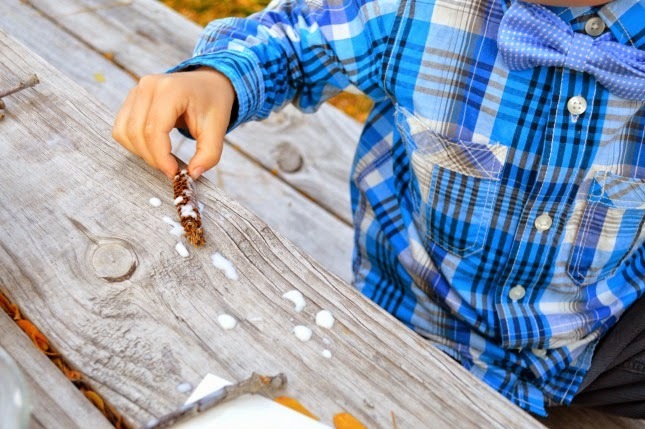 Behind every post is a potential tantrum, mess made, or Pinterest fail. 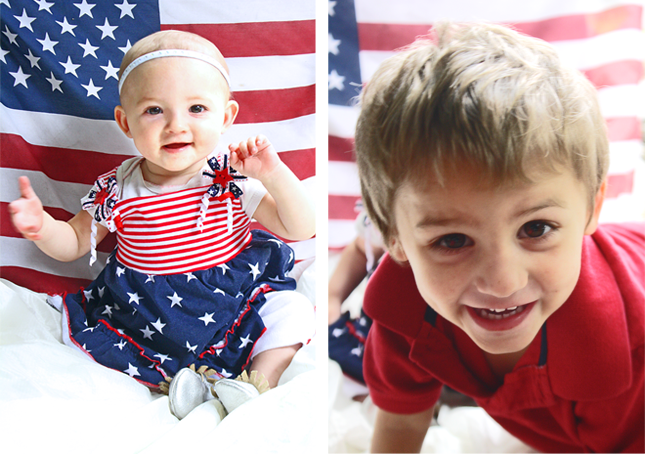 For example, here is the picture from our fourth of July recap. My baby girl looks beautiful and happily smiling. The photo well lit. What I didn't share, is the photo on the right, my little peanut totally photo bombing and screaming for my attention. Haha. As I scanned old photos I noticed this little guy popping up all over the place. Photo bombing level = expert. Photos I normally don't share, but probably will start sharing more often. Why not? I'm going to be real with you. Most of my posts require bribing, coaxing, kisses, and lots and lots of photos. 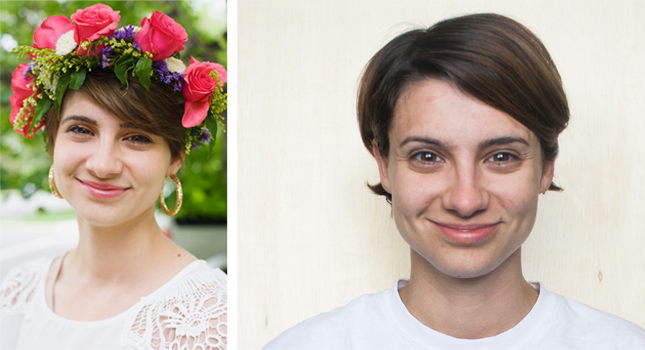 That beautiful photo on the left didn't just happen magically and sadly, not organically. You know how photos of my crafts usually are well lit and on a lovely white background like this one? Yeah, I am sitting next to window holding a foam board. For those who live in those magazine 3,500+ square foot homes, I say congrats and that's awesome. But, let's be real, most people do not . Most young mommy's my age are living in apartments or like me, small three bedroom homes. And guess, what? I love my home, I love writing and creating in my home, and I make it work. We have beautiful messy chaotic memories made every day in my home. So I cherish my small 1,400 sq foot imperfectly decorated home. I know many successful bloggers living in quaint homes and that's real. LEFT: My son screaming, "I don't want a picture." RIGHT: A decent version of my living room. It's usually even messier. And on that note, you should know that my home is messy constantly. Recently, I had a few beautiful women come to my home that I have met through blogging. 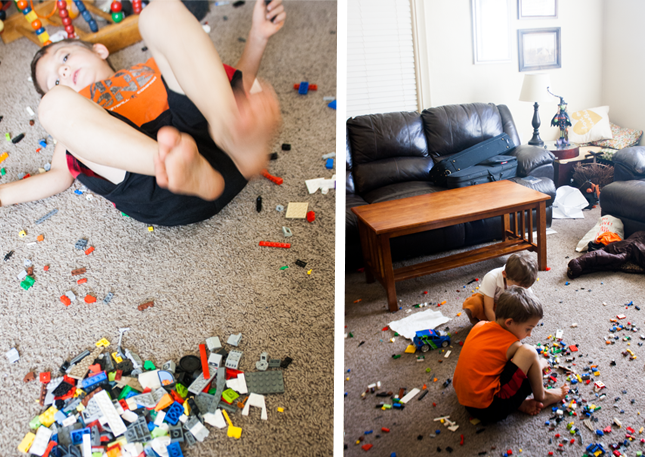 They witnessed the chaos that is my living space and filth that comes from four kids, a busy mom, and too little time. And it's ok with me because that's my reality and time of life. And all you should know this despite the clean pictures I post on the blog. Many people ask me how I do all that I do. Now you know, I have a messy home, and that's me being real with you. On another occasion a few months back I bumped into some fantasticly successful bloggers and writers at Chic-Fil-A. Was I perfectly trendy with coordinated children calmly clinging to my wrist? Come on, let's be real, I was wearing my morning workout clothes and probably smelled ahhmazing. My children were chicken-eating rag-a-muffins running around like chickens with their heads cut off. The ladies were so friendly to me regardless. But after that day I started thinking about how I should have dressed differently or had my children more perfectly coordinated. And then I rethought. Those bloggers didn't care, why should I? And even if they did care, why should I? That's me and it's real. Many of you have probably seen me in this state, workout attire and no makeup. And there's nothing wrong with that. It's just the real me. 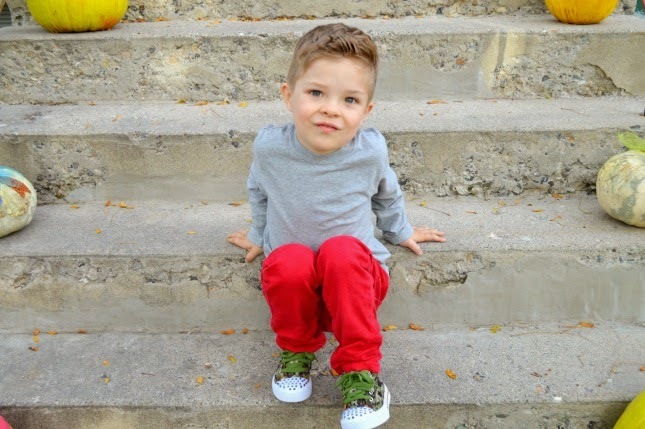 Some bloggers might always look absolutely stylish and their children obedient and poised. For me, let's be real, this is far from my reality. So the next time you scroll through blogs online gazing upon the magnificence of another's "life", know there's probably a tantrum, a dirty room, loads of money, and unnatural amounts of time behind that photo. We all cry at times, have stresses, and bad days. Many of us choose not share it. And that's ok. But internet, don't compare your lives to someone's best pictures, especially bloggers. Be you and live life. Please, never believe that because I'm not sharing some of my surroundings which include whining, screaming children, chaos, thrown items, missed deadlines, sorrow, and awfully composed pictures, know that it does still happen. Every darn day, actually. And that's this bloggers REAL life. Love for you all. We are all doing our best, helping each other, and those are the important things. Have a great rest of the week. During this time of year, my kids and I love to go for nature walks! The world around us is just so beautiful that we can hardly contain ourselves indoors! 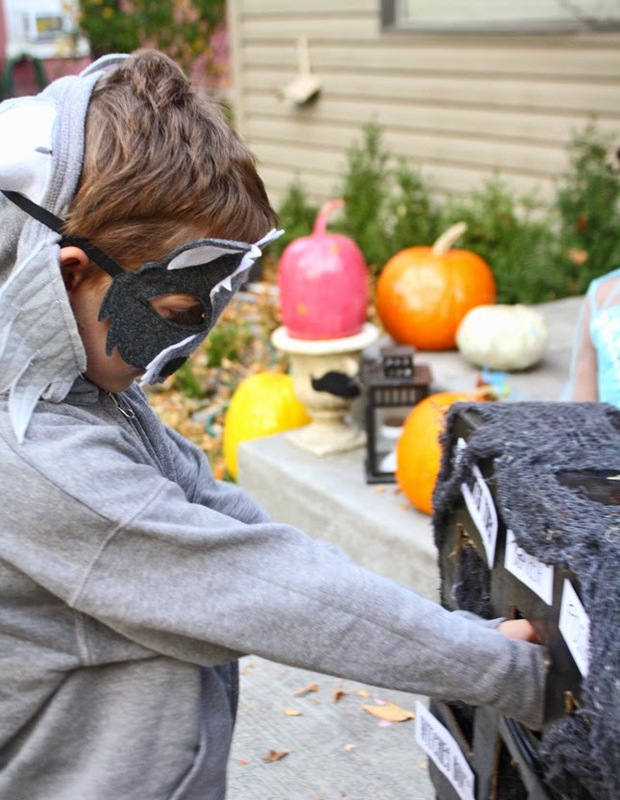 So, with baskets in tow, my older two kiddos eagerly race out the door and quickly begin to fill their baskets with all of the Autumn treasures they can possibly find along the way. 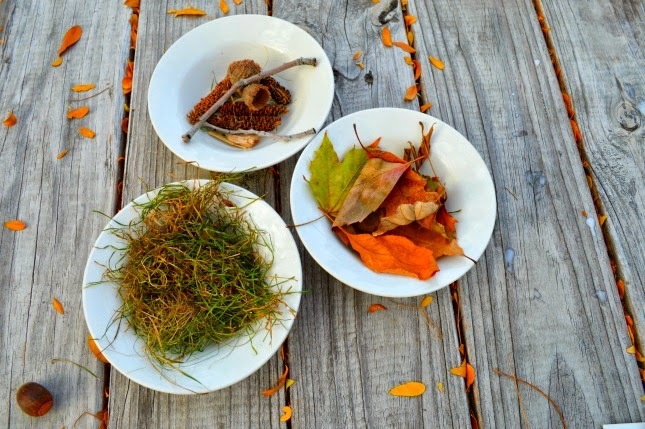 When our walks are finally over, each basket is brimming with nuts, leaves, twigs, grass, bark, and sometimes a bug or two that my kids simply refuse to part with; and being quite the collector myself, I totally get it! 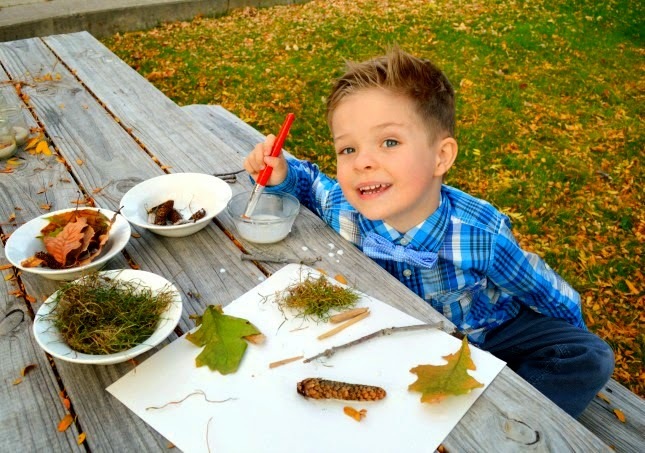 So, I've compiled a list of go-to art projects/activities that my children and I can do to get the best use and enjoyment out of the treasures we always find on these nature walks. Currently, Gus has been very interested in art. And wanting to foster this newest love of his, I thought it would be fun for Gus to tap into his artistic talent, and create a collage out of all of the items he found on our most recent nature excursion. Lucky for me, this project was very low key. Making it very easy for Gus to manage on his own and allowing me to sit back and enjoy just spending time with my little nugget. 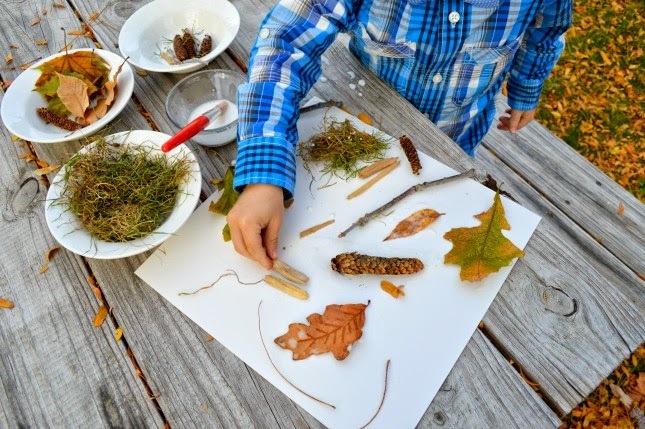 Whether your kids love art, or just love doing things with their hands, this activity is the perfect way to bond with your kiddos and bring a little bit of Nature's current beauty indoors. 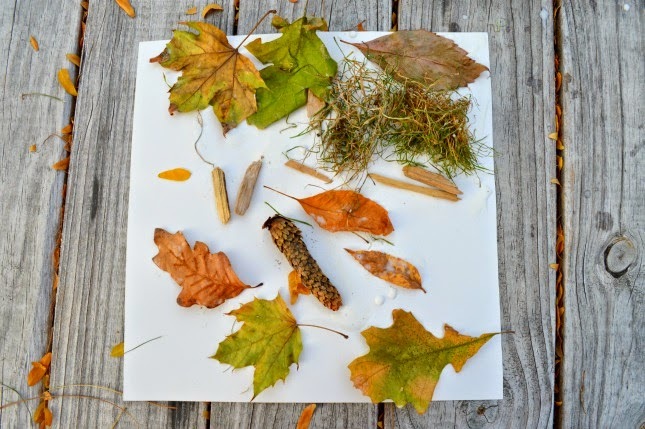 Twigs, leaves, pine cones, grass, and anything else...besides bugs...that you can find outdoors. 1. Divide you child's nature items into separate bowls to make it easier for them to pick and choose what they want to use in their collage. 2. 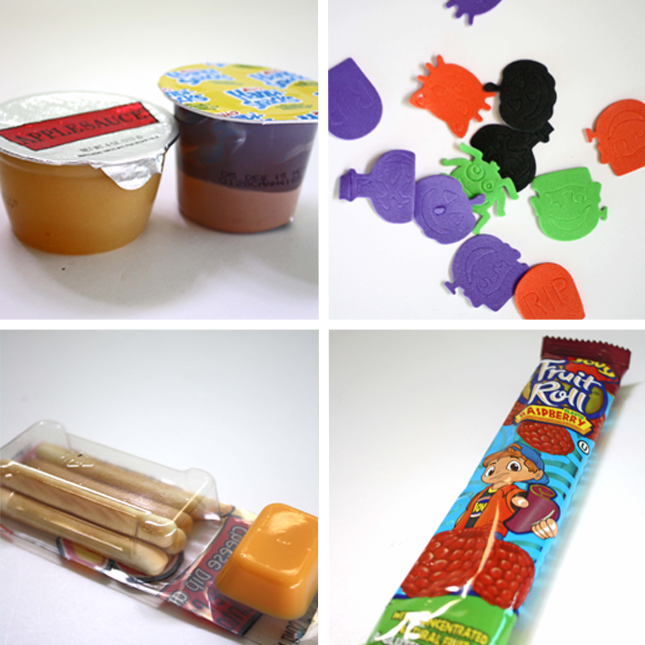 Using equal parts water and glue, make a mod podge like consistency in a small bowl. 3. Using a your paint brush, you can first model to your child how to dip the brush into the glue mixture and then paint it on a portion of your card stock. Then, have your child select a nature item or two from the bowl and place them in the glue mixture you just put on your card stock. 4. 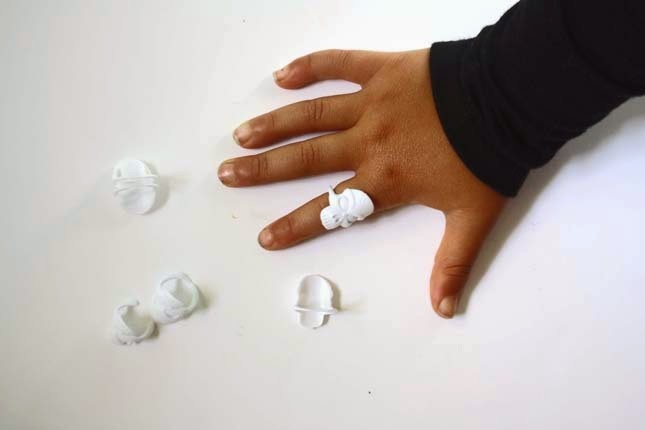 Let your child take over and watch their creativity jump onto the paper. 5. 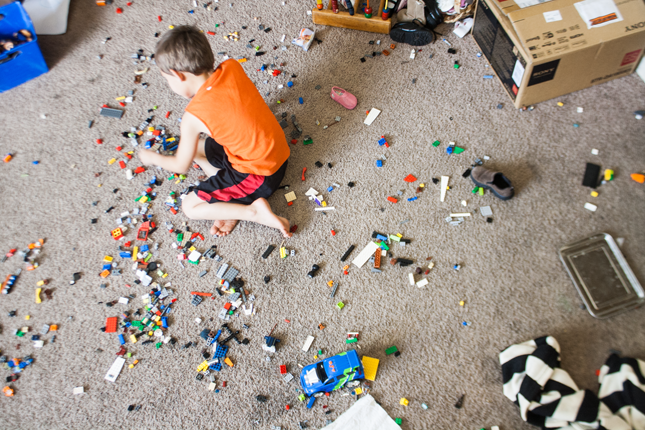 Once your child is complete with their collage, place it in an undisturbed location to dry over night. 6. When the collage has completely dried and set, find an easily viewed spot in your home where you can display your child's piece de resistance. For other fun nature inspired projects, go HERE and HERE. I remember going to Halloween carnivals as a child and playing all the fun games. There was this one game I remember playing where you had to stick your hand in a box and feel grossness that was supposed to be body parts and spooky things. The ickyness was actually food items but as a kid it might as well have been witch eyes. Well, I'm bringing that game back this year to add some fun in my hood. You could always make this a game for a party where you let the kids try to figure out what each hole has inside. I've seen people write out the answers and then number the holes and let the kids guess and match. So this game is great for Halloween parties, trunk-or-treats, or carnivals. 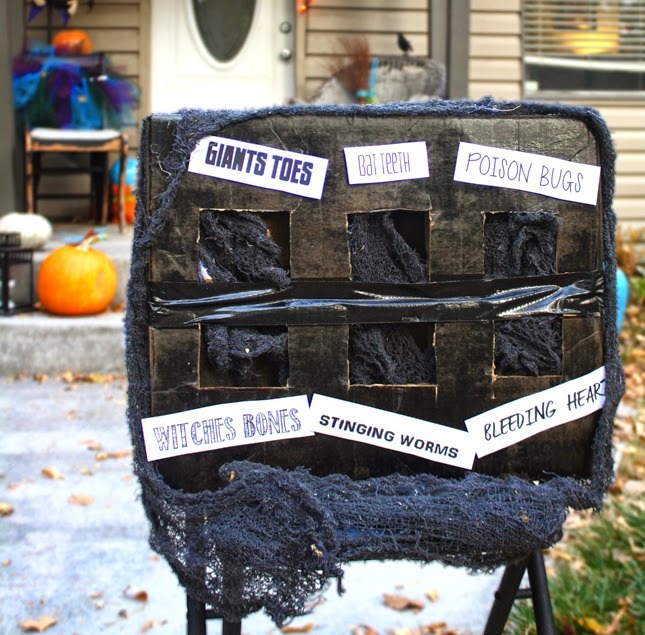 This year I'm going to have my Touch and Feel Game out by the door for trick-or-treaters to have a little spook if they daaarrree (said in a spooky voice). Halloween is almost here! Can you believe it? I'm kinda freaking out because once Halloween is over, Christmas is basically here. November and December seem to go like a million miles an hour. And I'm having a hard enough time keeping up with life. EEk! Well here's to one more weekend before the scary day and one less thing on my to-do list. Life is full of thrills. Whether it's a stomach lurching roller coaster, a trip to an exotic island, or a Taylor Swift concert, there are things in this life that we think are "Must-See" attractions; doing everything that we possibly can to view or even participate in them. To put it simply, life is full of endless things that we shouldn't miss being a part of; and one of those is childhood. For those of us who have children, or are blessed to have children in our lives through one way or another, we have been given the opportunity to be apart of one of life's greatest adventures. But, how many of us eagerly and willingly do all that we can to be a part of it? I wish I could say that I have. But I would be lying if I did; and that's something that breaks my heart yet also motivates me to share my thoughts on this matter, here. Maybe it's just me, but I feel like there have been many times when I have been privileged with the opportunity to witness something truly magical. But was then instantly distracted with something like a messy house, a work deadline, or endless errands; quickly realizing all too late, that I had completely missed out on being apart of the the fleetingly remarkable moment I had been given. That is how my children's childhood is for me. And I believe that with every fiber of my being. I'm sure you do too! But why then, do we so easily allow ourselves to let the beauty of this season pass us by? Oh how I wish I, or someone out there, had an answer to this! "We can't go for a walk today because I have 5 loads of laundry to do." "I will come and color with you in a minute." "No, I can't hold you right now because I'm in the middle of making dinner." Not fully realizing that as I did this, I was missing out on precious moments of my children's childhood that I would never get to witness or be a part of again. Slowly but surely, I have began to come to the realization that a clean house, met deadline, and accomplished errands aren't what make life worth while. My children are. Childhood is a Must-See Event. Unlike T.V. reruns, reunion concert tours, and 2nd edition published books it only happens once, and when it's over, it's over. 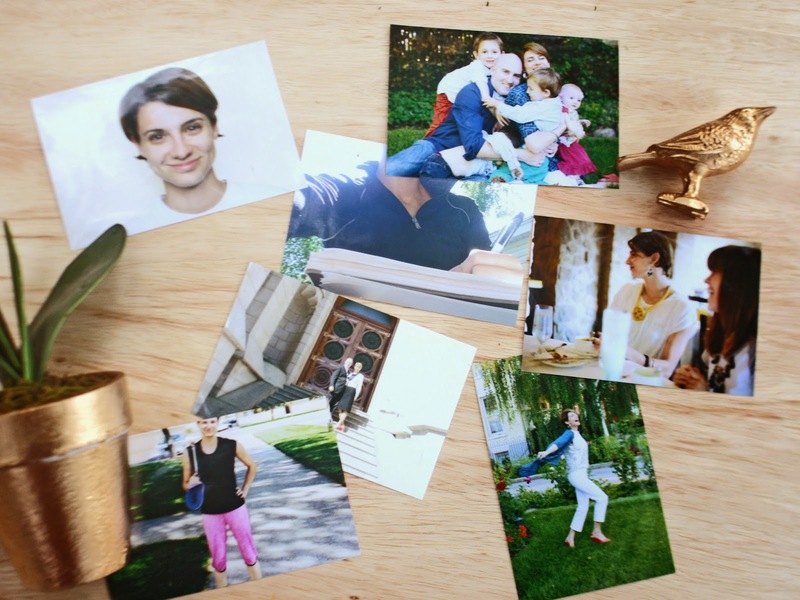 Leaving each of us with only photographs, memories, and other small mementos to reminisce it. I'm far from perfect, but one thing I will strive to become perfect in, is my role as Mother. 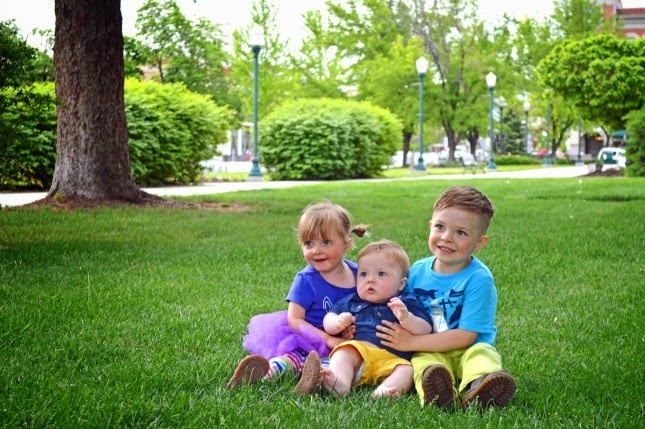 I have a hell of a lot of work to do, but I gladly except the highs and lows of this task because my children are one of the most important gifts I have ever been given and I want them to know they are more worthwhile than any roller coaster, getaway vacation, or Taylor Swift concert I may ever have the opportunity to experience. My beautiful neighbor, kids, and niece. Halloween is coming and one of my favorite parts is the treats and enjoying all the fun fall recipes out there. My kids love it too! I think they have even proclaimed Halloween better than Christmas. It was always thrilling for me was when I was a child when my siblings and I would dump out our Halloween candy to tally our loot. As a parent I enjoy the fun of Halloween but I also dread the crazy sugar high my children experience afterward. 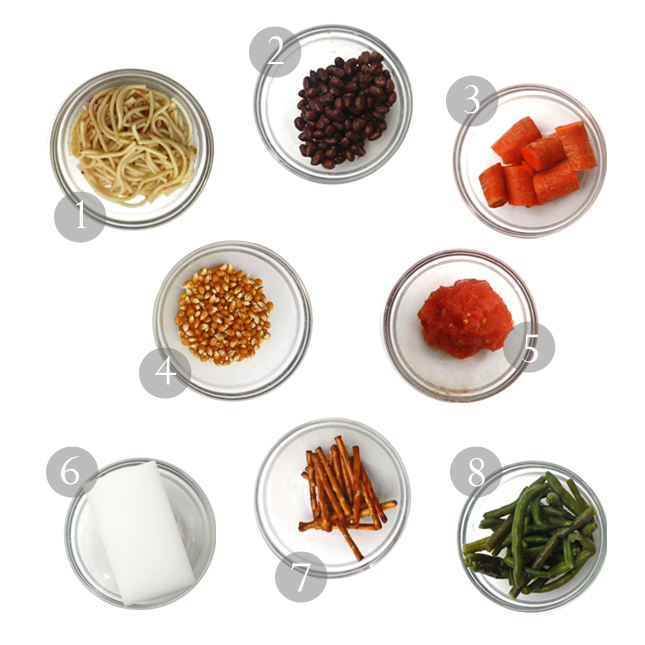 So today I'm going to share some healthier options that don't break the bank and can still be ultra fun treat options. Buying Halloween candy can also be costly too. At a popular grocery store a bag of mini chocolate bars is $8.98 for 80 pieces and the price soars from there. While looking at different candy available for Halloween I saw candy priced as high as $19.98 for 250 pieces! 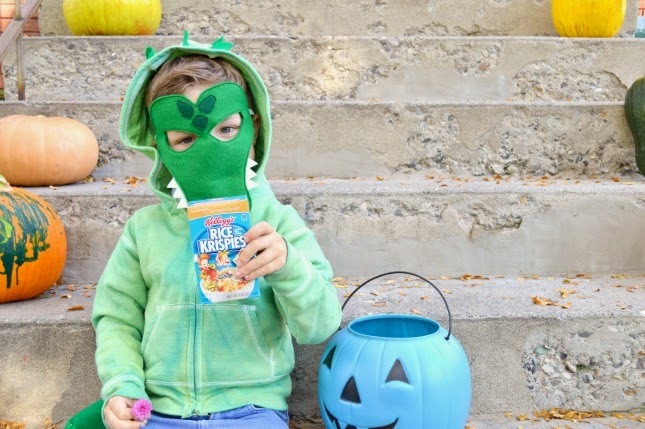 Our list has some items that are pricey too but we also share some very inexpensive options that are still fun and healthier than traditional candy. 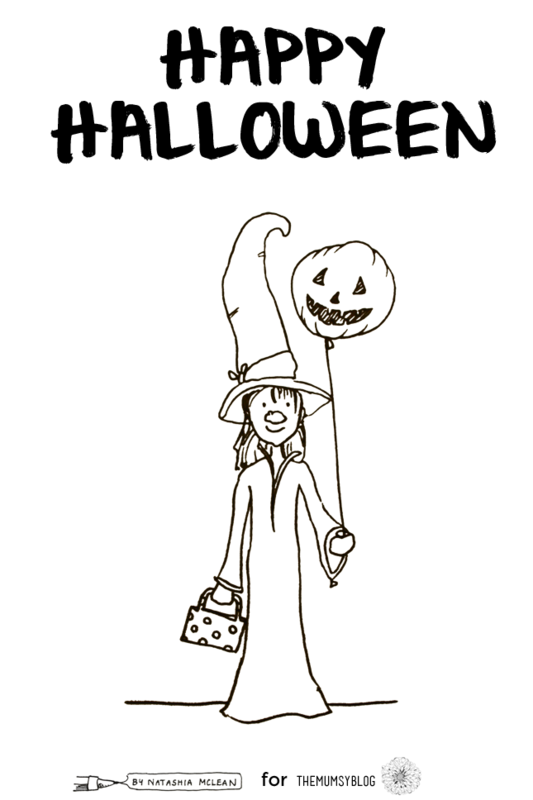 FUN IDEA: Buy a Halloween coloring book, or you can use this FREE printable too, and a box of crayons. Cut the pages out of the book. Package one coloring page and two crayons together by folding the coloring page and placing the crayons inside the folded coloring pages. 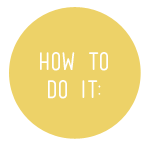 Here's how to make some too. I love this last option because I have seen how awesome it is! One of my neighbors does this every year and there is a line because everyone wants a balloon animal. So don't worry about not being the "cool" house when choosing healthier options. 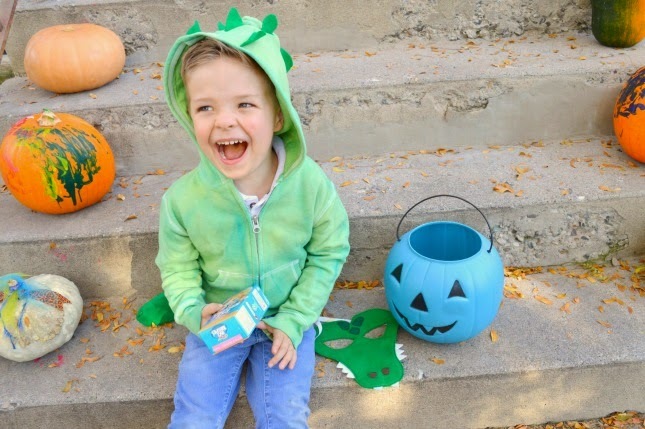 As parents we enjoy the fun of Halloween but the crazy sugar high our children experience afterward can definitely kill our excitement so I hope these and Michelle's ideas can give you other options for please the rug rats. As a child, my favorite part about Halloween was Trick-or-Treating! There was nothing I loved more than stuffing a pillow case full of candy and then coming home and gorging myself with the sugary treats until the thought of taking another bite made me absolutely sick. Now that I’m a mom, I’m not completely thrilled with the idea of my children doing the same thing; and I’m sure many of you who have children, feel the same way. *Note you can find these items at such places as Costco/Sam's Club, Oriental Trading, Party Stores, and Grocery Stores. 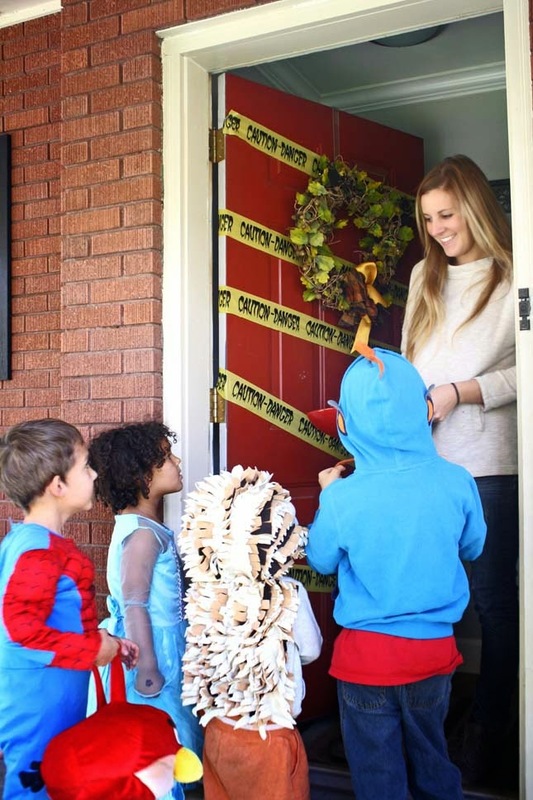 Whether you choose to give out one of these items, or go with something completely different, as long as you give out a healthy item that is both nostalgic and unique, your home will be absolutely witchin’ on Halloween! Graphic provided by Alice and Ivory. It's available here. Isn't it lovely? We have been thinking about this series for months and I have warm fuzzies writing this first installment of our Keepin' It Real Series. This first post is about being real with yourself. This is a topic that is really important to Michelle and I because it changes how you live and breath. And I hope that you sit a little higher after this post. And the next time you see your reflection you say, "That's me and I am awesome." So let's go back to the question, "Are you being true to you?" To be honest, there have been many times in my life that I, for one reason or another, did not know and love who I was on the inside and would have to answer the previous question with a "no". I am going to start from the beginning. Starting as a normal insecure teenager, I felt like I had to act, talk, and be a certain way to be accepted. Sure I had my friends who knew me. But every once in a while I would be able to put on this face of who I thought I should be and I would make friends who in the end weren't really my friends. Looking back the problem was I was pretending to be someone I wasn't. After high school I transitioned into adulthood and some of those ideas of my self-image stuck with me. You may have watched my interview with The Beyouty Bureau. In the interview I mention this topic. I talk about how I wasn't being true to myself. And how I felt I had to be sensual and constantly witty which isn't even a small bit of who I am. Even into my adulthood I often didn't feel comfortable with who I really was and my personality. And I would hide it with a reserved smile. Often after a conversation, a series of dialogues would run through my mind of how I should have talked or phrases I should have said. Being dorky or stumbling over my words embarrassed me. I wasn't accepting who I was and I would put myself down for acting the way I thought I was supposed to. Through my adult life I also struggled with my identity through life's changes. It's hard to know who you are when life changes so fast. I was a crazy work hard, stay up late, figuring out life college girl who got married young. Once I got married we moved to Utah from Las Vegas, which is culturally opposite, and I had to once again try to find myself. 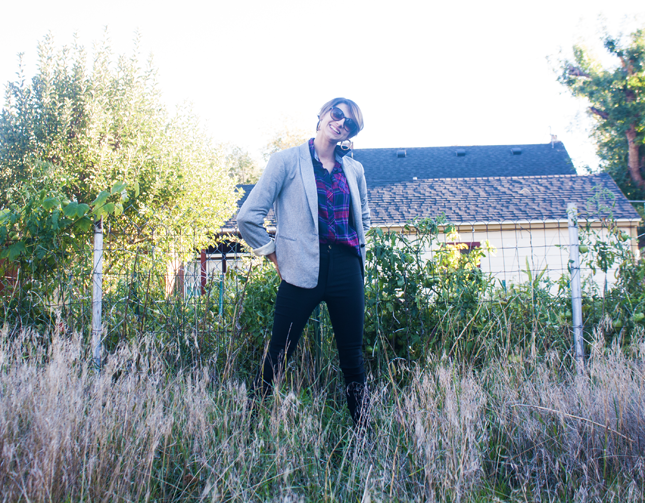 It's embarrassing to say that, once again, I felt like I had to dress and act like what I perceived was the Utah way. With each life change I have had to scramble to take pieces of who I was and put them together in a new mold to find who I am. As I got married, moved, and then became a mother I had to try to figure out who I was again and how I would act and think. For me becoming a mother was a huge "finding myself" moment and I think that's pretty common. Becoming a mother means you are now responsible for another human being and changes you. 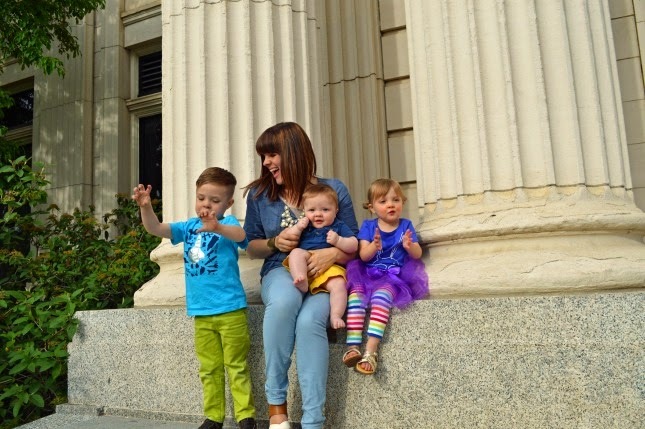 Being a mother also meant I would quit working and eventually schooling. I became the hotdog eating, baby book reading, stay at home mommy milk machine and very different than the person I had been just a couple years ago. With each year and as each life event has happened I have had to find who I was again. And in life this is going to happen often. We change grow and learn. As I began blogging about a year ago, I had to discover who blogging Natashia would be. How would the blogger version of me act? I saw other bloggers and their writing, personalities, photography, and even dress styles. It wasn't hard to follow people on instagram and think I, once again, had to act and be like them. And then something happened that has changed me. After a conversation, I was habitually overanalyzing in my head. I felt exhausted with the negativity within my own mind and it hit me, it is awesome to be me. I am imperfect, silly, happy, fun, goofy, and that is me. I had created this idea of perfection that was damaging and negative to who I really was. So what if I didn't say what I thought others wanted me to? That isn't what matters. What matters is what I think about myself and that I am happy with who I am. And that person is me. I am grateful that I have met other bloggers and creative who are awesome examples of being themselves. Thank you for being you. Your courage has given me courage to say, "Ok world, this is Natashia. Take it or leave it." I am not really the Angelina Jolie sulky type. I stumble over my words and ramble often, so I am definitely not perfectly composed as I, for some reason, thought I should be. I also learned that part of accepting who you are means accepting all of who you are. You have to accept your flaws. For me this has been really hard. I feel like I try to do things as perfectly as I can. But I am not perfect. I forget appointments, all the time actually. I say comments, sometimes without thinking them through. I am crazy, sloppy at times, loud, interrupting, perhaps a little too aggressive when passionate, short, in your face, and completely me. And while I am trying to be the best version of me possible and am constantly improving, I've decided not to tear myself apart anymore for my imperfections or the ways I act that I thought were imperfections. I have also embraced my positives. I am kind, patient, thoughtful, giving, emotional, empathetic, sensitive, funny, happy, positive, appreciative, strong, and loving. 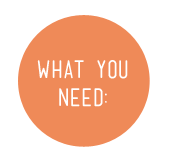 As a blogger branding is really important. A brand is a name, design, or symbol that defines and identifies something from other things within the same category. Today we are going to talk about your brand. Do you know it? Part of my struggle was I didn't know my brand. At this moment in my life I am a wife and mother. I am religious and pray, everyday. I love health and fitness and feeling physically strong. I am creative and have no idea at the moment where to even start because I love so many aspects of creativity. I am hard working. I can be so silly at times that my kids giggle, their eyes widen, their lips smirk, and they say, "Mom you're funny." I give really good hugs. And this is me. So lets have some fun. I am challenging you to pick 3-5 words that describe your brand. Who are you and what defines you? Seriously, I want you to get out a piece of paper, right now. Alright, did you do it? Ok now number it. Ok now think. What words describe you in a nutshell. Here's my words for my brand. This journey has been taken by many, and maybe for some of you, you gained this confidence earlier. But for me accepting who I am as the blogger has given me greater confidence as a whole and it has been really liberating. There's something empowering saying, "Hey world and internet land, this is ME!". 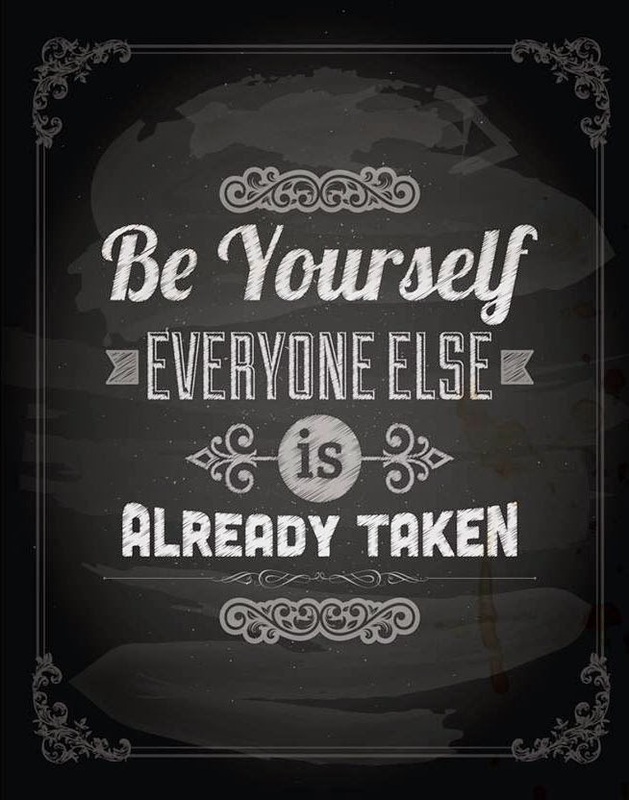 Its time to stop trying to be someone or something that you aren't. It's not only ok to imperfect, but its part of human nature. So let keep it real with ourselves. Be true to you and love yourself for who you are. Thanks for reading my thoughts and my story. Feel free to share yours. I wish you all the best weekend. You all know Halloween is my favorite holiday, but it is also my son's favorite holiday too! When it comes to anything creepy, crawly, or spooky, he instantly becomes obsessed with it; especially when it comes to the things he wears! So, I thought it would be fun to transform a pair of sneakers into a set of oogly googly shoes that he can wear any place he goes! 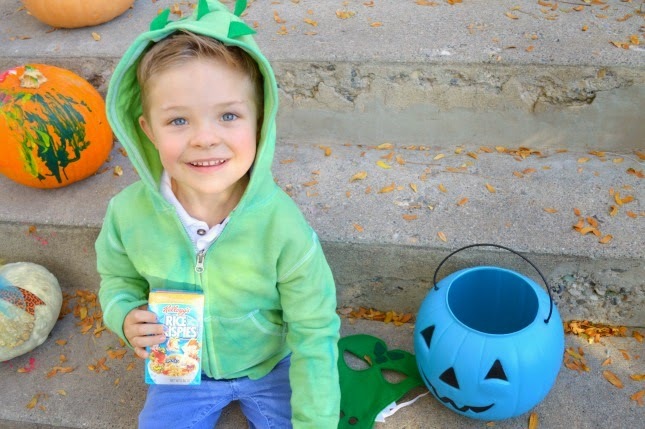 If you too, have a Halloween-loving little kiddo then this DIY project is the perfect bonding activity for the two of you to do! 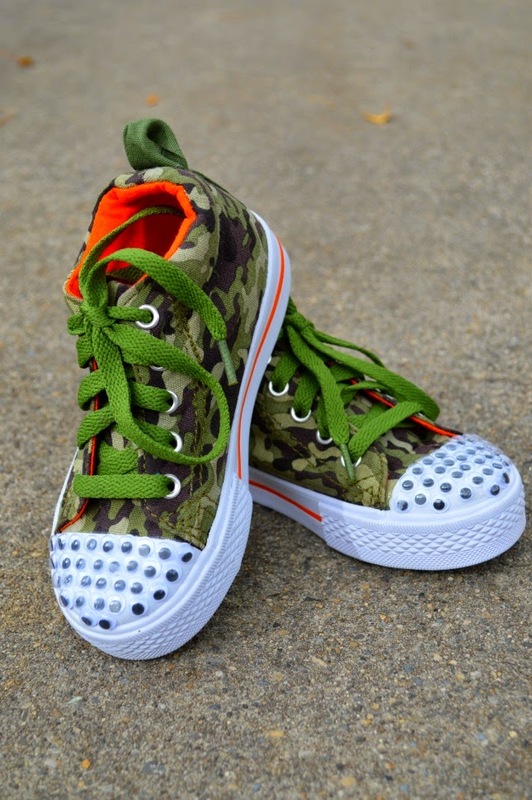 Camo Converse Sneakers-I got Gus's at Walmart for $12.97. 1. Glue the eyes all over your shoes without over lapping any of the eyes in order to get the strongest bond. 2. Allow the glue to completely dry. 3. 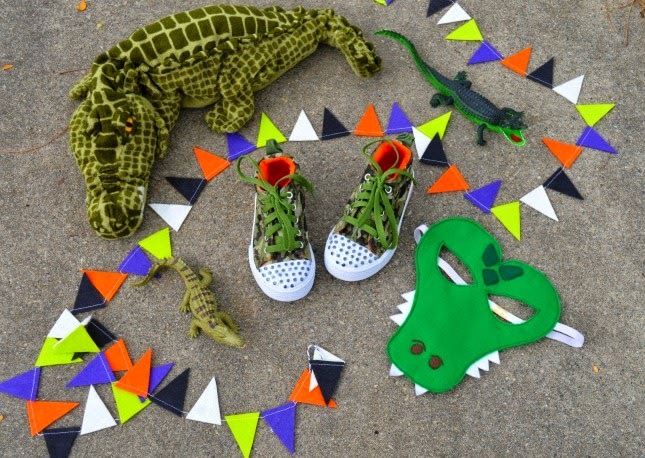 Let your kiddo enjoy wearing their new googly eyed shoes with any and everywhere they go, and get ready for second glance or two! It's all about the plaid this fall! Now, we are big fans of wearing what you feel most comfortable in. You can read more about that in a awesome post by Michelle that talks about wearing whatever the heck you want to here. So even though plaid is a trendy or fashionable right now, it doesn't mean you have to like it or wear it. In fact, I wasn't the biggest fan when plaid fashion first started becoming trendy. I personally feel like I don't look the best in collared shirts because of my broad shoulders. And I didn't know how to quite wear plaid fashion without looking like a lumberjack or a farmer. I did however love the fall and winter feel that plaid gives to a look. I mean, when I look at all that plaid it makes me think of a warm cabin surrounded by trees and the light frost of winter. Don't you just think plaid and then hot chocolate, delicious hot chocolate? So I wanted to find some fun and maybe different ideas of ways to wear plaid. And if you are wanting to wear outfits with plaid too, I've got some awesome ways of wearing plaid for you. Tip #1: Pair feminine pieces with plaid. 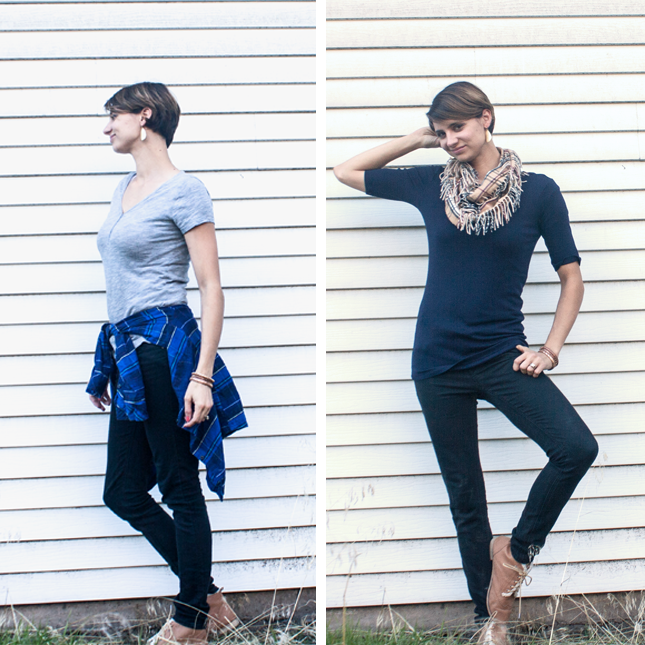 For me, I feel like a plaid shirt can be masculine so all of these looks have a flair of femininity. In a handful of these looks I am wearing a bib necklace to add femininity and variety. Other ideas are to wear lace, silk, or tulle with you plaid. Tip #2: Try layering when you wear plaid. You can layer with cardigans like pictured on the left. 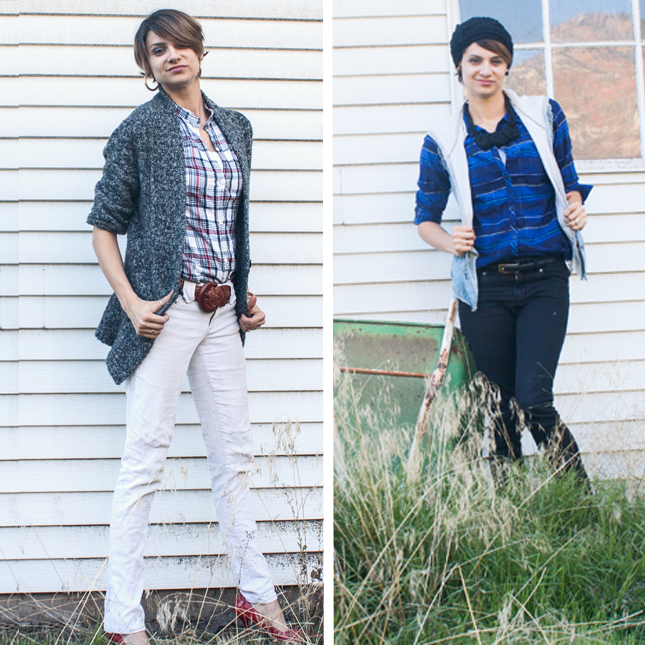 Or another plaid outfit idea is layering with a jean vest for a more urban feel as pictured on the right. Also try layering with a full jean jacket with black pants, a blazer, sweater, or sweatshirt. Adding the layers will not only keep you toasty this cold season but helps step away from the harsh look of plaid and jeans. Don't you think? Tip #3: Dress up your plaid. 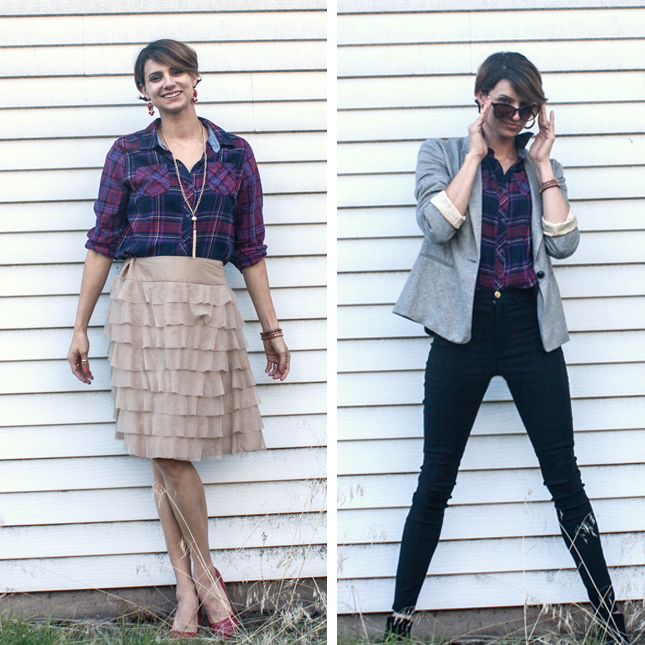 I love the tulle skirt and plaid top look as it mixes style types as pictured on the left. You get the ultra feminine feel from the skirt with a harsher feel from the top and they get paired to make this beautiful combo. Usually when you think of plaid shirts you may not think of them as a "dressy" piece, but don't be afraid to try some more formal pieces with them like the blazer plaid top combo on the right. Other ideas are tuxedo skinny jeans with a plaid top tucked in or a pencil skirt. Just throw on some pointed heels and you're ready! Tip #4: Change up the bottoms. Instead of wearing traditional jeans try a pair of faded distressed jeans, black, gray, or white skinny jeans to get away from the farmer or lumberjack look. For most of these looks I tucked in my shirt to give these plaid shirts a more sophisticated look. Tip #5: Step away from the plaid button up. This way is my favorite solution to wearing the plaid trend because it gets away from the plaid shirt problems I was having as mentioned above. If you don't like the button up or collared look you can definitely find other alternatives. Try a knit cardigan as pictured on the left. Or just look for clothing with plaid prints such as this 3/4 sleeve top on the right. (This plaid top was under $10 and you can read about where to get it here) Michelle has a plaid blazer she has been wearing this season and I think its a great example of this tip. Look for plaid skirts, t-shirts, or even dresses with hints of plaid. Forever 21 has a good selection of plaid that steps away from the plaid button up and that's where I got the cardigan on the left. Shopping time maybe? Tip #6: Wear it in accessories. If you can't get into the plaid look but wanted to sport it a little you can always have it in your accessories. You can find plaid scarves like the one pictured above on the right, bangles, and purses to add to your outfits. Another fun way to wear plaid is to tie it around your waist. Bam! You're sporting the plaid trend without really wearing it. You could tie it around your waist with a t-shirt or sweater and it looks great! Tip #7: Mix textiles and patterns. I think this tip is super fun. And my creative side says, "Yes!". Try wearing a lace undershirt and plaid. Or try leather pants and plaid. Don't be afraid the think outside the box. 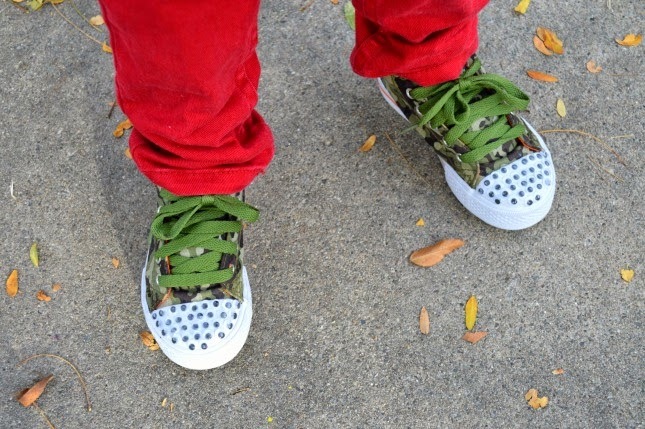 You could also try floral prints, leather, or suede with plaid. You really cant go wrong. Alright, so there you go. 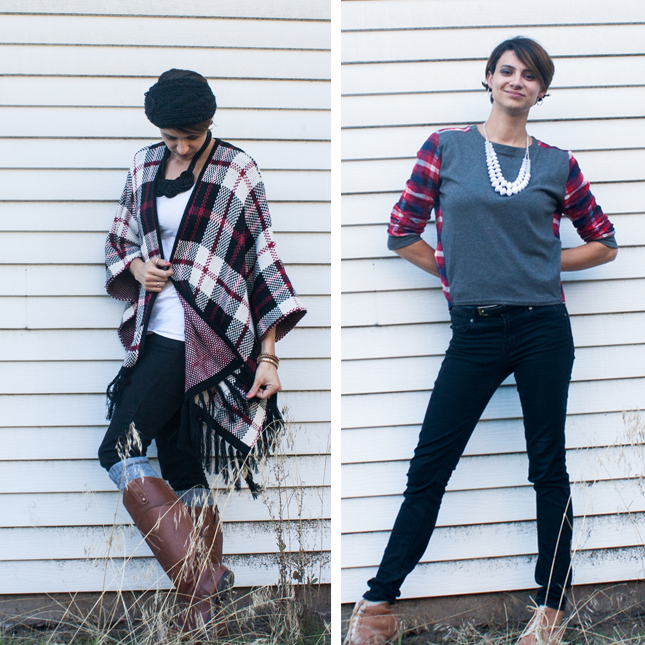 Plaid in a nutshell with lots of different ways to wear it! How do you like to wear plaid? Or do you even like it at all? Which look was your favorite? I'd love to hear about it! Have an awesome Tuesday and as always much love to you all!